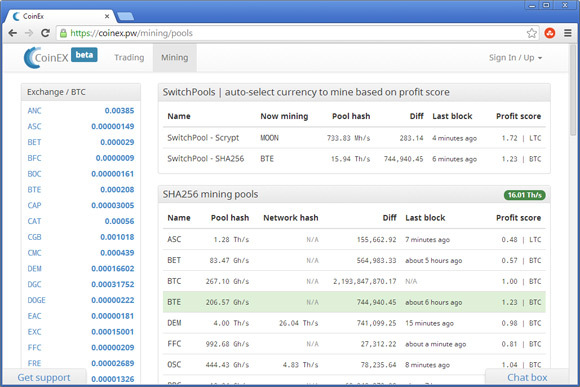 In the last 24 or even more hours Multipool has been having some serious problems, and that is causing problems for people mining for DOGE coins and other alternative scrypt cryptocurrencies as they do not know where else to mine them in a pool that automatically switches to the best and most profitable coin. But even if you are mining for DOGE coins directly, you might want to find a good alternative for mining instead of multipool. One such interesting place is CoinEX – a mining pool much like multipool that also has its own crypto exchange, so you can save the trouble of transferring the coins to a separate exchange like Cryptsy for example. Instead you can mine, trade the coins and withdraw them directly to your wallet all in one place. So far Coinex is working quite well and though it is not as big as Multipool or Cryptsy it seems to be much more stable. So if you are looking for alternative mining pool to Multipool, then do check Coinex now and start mining DOGE or other alternative cryptos there… at least until multipool resolves their issues. Coinex, much like multipool, does have both SHA-256 and scrypt-based crypto mining options and you can either mine directly a coin you want or use the automatic switching option. Furthermore the Coinex mining pools offer more options for alt coins that what multipool currently have, so more chances for higher profitability not only from DOGE, LOTO or MOON, but other alternative coins as well. The pool fee is Pool fee 2% which is a little higher than Multipool’s 1.5%, but between 0.5% higher fee of something than 1.5% of nothing the choice should be easy. Another interesting alternative is LTC Rabbit, an LTC and alternative scrypt crypto mining pool where the coins currently mined are also automatically selected by the pool based on profitability. The difference however is that you are being payed directly in Litecoins, it is as if you are mining for LTC and you earn LTC from that plus you also get additional alternative crypto coin bonus based on the current profitability of the alt coins mined such as DOGE for example an that bonus you get also in LTC directly in your account. This saves you all the trouble and waiting of having to transfer the mined alternative crypto coins to an exchange and then trade them for LTC and the profitability you get is not that much lower than if you are mining alternatives and then trading them on an exchange.